Port Campbell, a resort and cray fishing port facing Bass Strait in western Victoria, is on the Great Ocean Road about midway between Cape Otway and Warrnambool. It was named after Alexander Campbell, a farmer, whaler and trader. 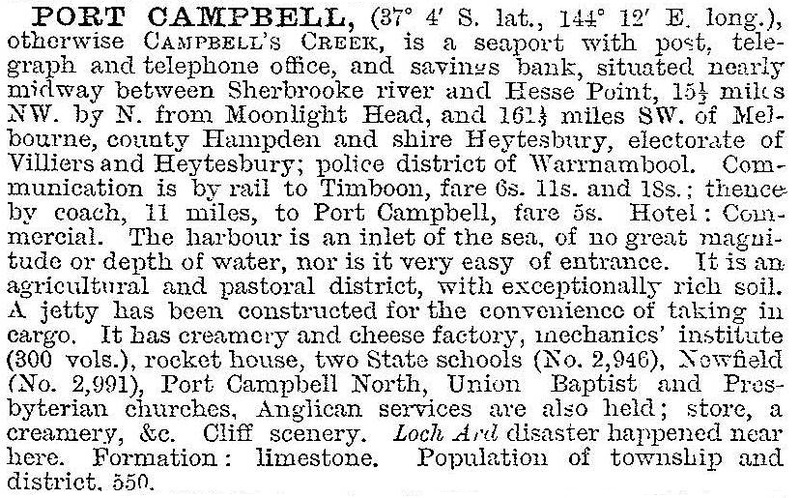 Campbell took shelter in the Port Campbell inlet during a Bass Strait storm in about 1843. Port Phillip’s Superintendent LaTrobe showed Port Campbell on a sketch map that he drew in 1846. Settlement at Port Campbell did not occur for some years, apart from the Glendample pastoral property (1845) which extended from east of Port Campbell to beyond Princetown. A subdivisional survey for a township at Port Campbell occurred in 1875, after farm selections had been taken up southwards from Timboon. Until the railway reached Timboon from Camperdown in 1892, Port Campbell was used to transport goods to and from the farms. A school was opened in 1877 and a jetty was built in 1879. Port Campbell received considerable publicity in 1878 when the iron clipper ‘Loch Ard’ was wrecked at Mutton Bird Island about 12 km east of Port Campbell. The wreck is commemorated by the Loch Ard Gorge, just east of Mutton Bird Island, where the two survivors of the wreck found shelter in a cave. The Loch Ard was one of several ships that were lost on the coastline known later as Shipwreck Coast. The loss of shipping activity after the opening of the Timboon railway line was slightly offset by the development of holiday facilities and guest houses at Port Campbell during the 1910s and 1920s. A golf links was opened in 1912. Road access from Timboon was improved in 1926, and road access from the west was improved in 1927 when a bridge was built over the Curdies River Inlet at Petersborough. It was one of the elements of the Great Ocean Road (1919-32), which joined several earlier road sections in a continuous road from Aireys Inlet to west of Petersborough. (The section from Port Campbell to Princeton pre-dated the Great Ocean Road). Tourism was further acknowledged when the Port Campbell Progress and Tourist Association installed Australia’s first reputed comfort station in 1938. Throughout the postwar years Port Campbell was troubled by inadequate water supply, particularly during the summer holiday season. It was rectified with a water bore in 1966, not before time with surfing having become an added attraction. A boating club and a sports complex were added during the 1970s, and the Heytesbury District Historical Society was headquartered at the old hall in 1977. In 1964 the Port Campbell National Park was set aside, and in 1981 it was enlarged to 17.5 sq km, mostly a narrow coastal strip south of the Great Ocean Road from Petersborough to the Twelve Apostles, some tertiary sandstone stacks close to the shore. Since the late 1980s the Port Campbell coastline has been a strongly promoted scenic attraction. Motels have replaced the guesthouses of 50 years before. There are also a hotel, a caravan park and a camping ground. Port Campbell has a small shopping centre, two diving shops, charter boats, a modern information centre, a museum, tennis courts and surf life saving club. In 2012 land along the Great Ocean Road and the nearby hinterland along the south Victorian coast was rezoned to allow for tourism developments. The Save the Port Campbell Headland community group vigorously opposed a development for a large retail and hotel complex on the headland. From 2013 the oil and gas company Lakes Oil explored for gas near Port Campbell.